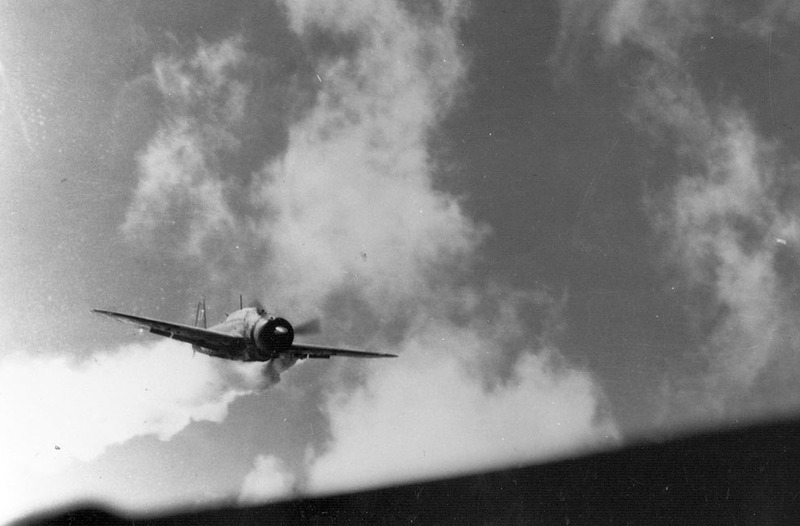 a Japanese kamikaze aircraft, smoking from antiaircraft hits and veering slightly to left moments before slamming into the USS Essex. Pictures of the Pacific theater. Soldiers in Bougainville, Solomon Islands, in March 1944, after Japanese forces infiltrated their lines during the night. The tank is named Lucky Legs 2. Gen. Douglas MacArthur, center, is with is officers and Sergio Osmena. Two U.S. Marines use flame throwers at Japanese defenses that block the way to Iwo Jima's Mount Suribachi. Two of twelve U.S. A-20 Havoc light bombers on a mission against Kokas, Indonesia. 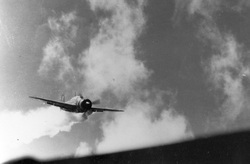 The lower bomber was hit by anti-aircraft fire after dropping its bombs, and plunged into the sea, killing both crew members.